Good evening, space fans! Here's what went on with our off-planet pioneers this week. Preparations are underway for Tuesday's detachment of the SpaceX Dragon space freighter that arrived at the ISS in January. The Dragon will be loaded up with scientific experiments to be analyzed back on earth. Also aboard will be non-essential hardware and a space suit with a malfunctioning fan motor (another space suit aboard the ISS had the same problem, but was repaired.) The Dragon will be grappled by the 57.7-ft. Canadarm2 robotic arm, then sent back to earth by way of a splashdown near Baja, California. Another vehicle currently docked at the ISS will be sent home this week, albeit to a fiery demise. The European ATV-5 cargo vehicle will be loaded with trash and sent home to burst into flames in the atmosphere as it deorbits on Valentine's Day. How's that for burnin' love? Artist's rendering of the ATV-5 controlled reentry. Happy Valentine's Day from space! Other scientific endeavors of note this week on the ISS included Commander Butch Wilmore analyzing seedlings in the APEX-03 experiment to determine the effects of microgravity on plant cells and root systems. ESA astronaut Samantha Cristoforetti analyzed roundworms in an Epigenetics study, which will assess if new cells develop significantly differently in micro-g.
CNN ran a story on the planning, packaging, and consumption of the food that gets transported to the ISS. 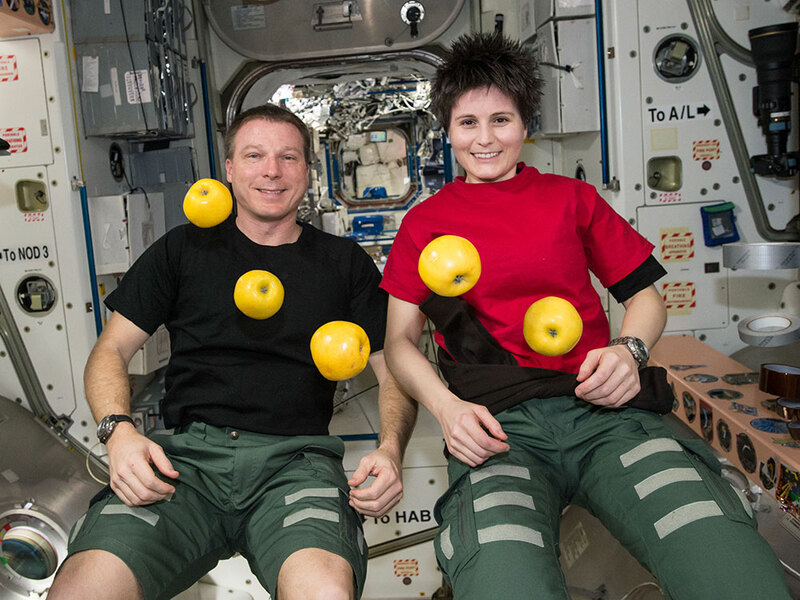 Since the human body cannot truly be at rest while constantly floating in micro-gravity, the astronauts must imbibe 3,000 calories a day, more than the average human on earth should consume. Food scientist Maya Cooper of the Johnson Space Center explains that their team, who are responsible for 40% of all the food sent by NASA to the ISS, tries to "strike a delicate balance between providing home comforts and healthy food." This includes everything from M&Ms to birthday cake on the comfort side, but a carefully-reformulated program of sodium reduction on the health side. Of course, every now and again after a cargo launch, a special treat like fresh fruit might be the first thing out of the hatch. Astronauts Terry Virts and Samantha Cristoforetti were eager to help unpack the latest SpaceX Dragon, which delivered (among other things) this precious golden cargo. Back on earth, this week astronaut Scott Kelly concluded his aquatic training, which is designed to mimic microgravity. Kelly will be headed to the ISS in March as part of a pioneering endeavor to spend a full year in space. Looks like he's good to go! On land...on sea...and in the lack-of-air...astronauts always take care of business! Want to see the station for yourself (albeit from beneath the surly bonds of gravity?) Check out Spot The Station and receive text or email alerts whenever the ISS will be flying by your area! Then, if you happen to leave your lens open and capture an image of the ISS, tag it to #SpotTheStation or @SpotStationAUT (for Android users.) Enjoy images by space fans from all over earth! The space station, captured in long-exposure, swoops past Reunion Island, off the coast of Madagascar. That's all for this week, space fans! See you next Sunday for news on two upcoming spacewalks...watch this space! Commander Wilmore captured a nice, bright flyby this week. If you live on the East Coast of the US, you're in this video.